The book focuses on understanding the emerging potential once local initiatives are interlinked and scaled-up to transnational networks. 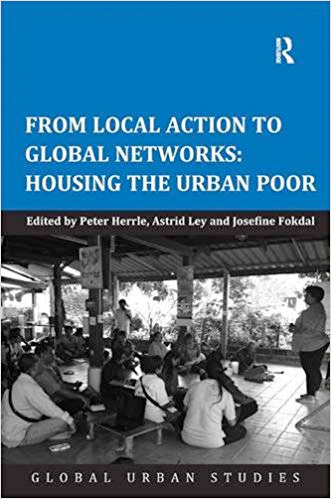 This book published by Ashgate in the Global Urban Studies Series and edited by Peter Herrle (TU Berlin), Astrid Ley (International Urbanism, University of Stuttgart) and Josefine Fokdal (TU Berlin, now University of Stuttgart) is based on a DFG research project that included empirical studies in Thailand, the Philippines and South Africa. It brings together different perspectives on multi-scalar approaches within the housing field and on grassroots’ engagement with formal agencies including local government, higher levels of government and international agencies. Housing issues have to be looked at from new angles: they can no longer simply be addressed through localized projects, but rather at multiple scales. By moving away from romanticizing local self-initiatives, the book focuses on understanding the emerging potential once local initiatives are interlinked and scaled-up to transnational networks.